Following my undergraduate degree in Japanese at the University of Edinburgh, I was lucky enough to secure the support of the John Speak Trust in continuing my language studies at a language school in Tokyo for three quarters of a year as the next step towards pursing my long-time dream of studying animation in Japan. This has really enabled me to concentrate on improving my language, in all four areas, without having to worry too much about the money side. So I was able to graduate from my language school’s highest class, with a newfound confidence in my ability to speak and live in Japanese. Reflections of buildings in a canal in Nagoya, taken on a trip just past new year. My language school followed the philosophy that Japanese is best taught in Japanese, forcing us to use what we knew and practice all the time, and I tried my best to eat, sleep and breathe Japanese in my free time too. Through reading, watching Japanese films and TV without subtitles, talking with friends and my host family, even learning a few Japanese songs on my guitar. It surprised me how quickly I found myself improving and having less trouble understanding what was happening. So I guess it is true that full immersion in the target language does wonders for language learning. I am super grateful to the John Speak Trust for helping me financially to realise this experience. 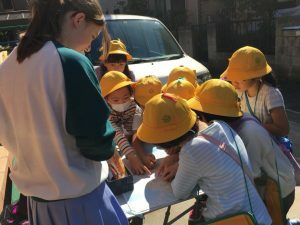 My host family’s 8 year old daughters school had a day when they went round in groups finding out about local businesses, etc. I helped out by talking about how Homestay works and what Scotland is like. interesting, but as time went by I began to really enjoy writing my reports. Challenging myself to use the grammar I’d learnt recently in class to write more and more in-depth and (hopefully) more engaging reports for the reader. Thus developing my writing skills while reflecting upon my experiences while I was there. 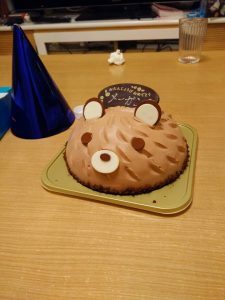 I now end my scholarship with a lovely reminder of my time in Japan and a new interest in blogging that I hope to continue which I might never have discovered without the push from the Trust. By far the best thing about my experience in Japan was my wonderful host family. They welcomed me into their home and made me feel like I was just another family member. Which was of great comfort in a country so far from “home”. They joined in my celebrations when I did well on tests, and supported me through various issues, including when my wallet with my residence card, health insurance card etc in disappeared on a night out with friends (quite probably stolen). I loved coming home and playing with the kids, or listening to Hiba (the kids great-grandma) telling stories of what her corner of the world was like 60~80 years ago, her escapades with the Yakuza (the Japanese Mafia) or through the war (WWII). 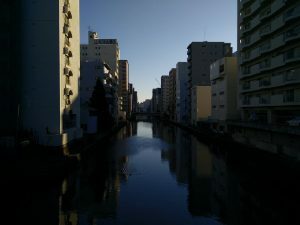 I learned so much more than just language by staying there, on a vast range of subjects ranging from dinosaurs to history to Japan’s school system and culture. But more than that, I have come away with a second family. Nothing can compare to how I felt when the youngest child (a mischievous little 4 year old) told me he loved me for the first time, nor when I found out he asked after me on the nights I was out. It made leaving Japan all the harder. A sign I saw at Starbucks explaining how to sign “like” and “dislike”. 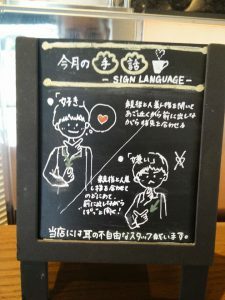 And that they have hearing impaired staff working at that branch, I thought this was a really sweet idea. I cannot thank the John Speak Trust enough for all the support I have received from them, and I will treasure the memories forever. This experience has allowed me to grow so much, I would whole heartedly recommend it to anyone considering it. I feel like living in a foreign country opens up a multitude of new experiences, and broadens your horizons. I am now counting down the days till I go back to start studying at a Japanese University in early April as the first UK undergraduate MEXT (Japanese government) scholar, which I do not believe would have been possible were it not for the confidence I gained from my experience with the Trust.